↑ Voices from the Smithsonian Associates. Les Paul, Musician and Inventor. Archived at www.archive.org. 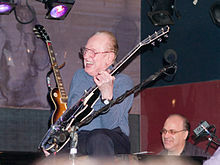 ↑ Guitarist and recording pioneer Les Paul dies, aged 94. The List. August 13, 2009.